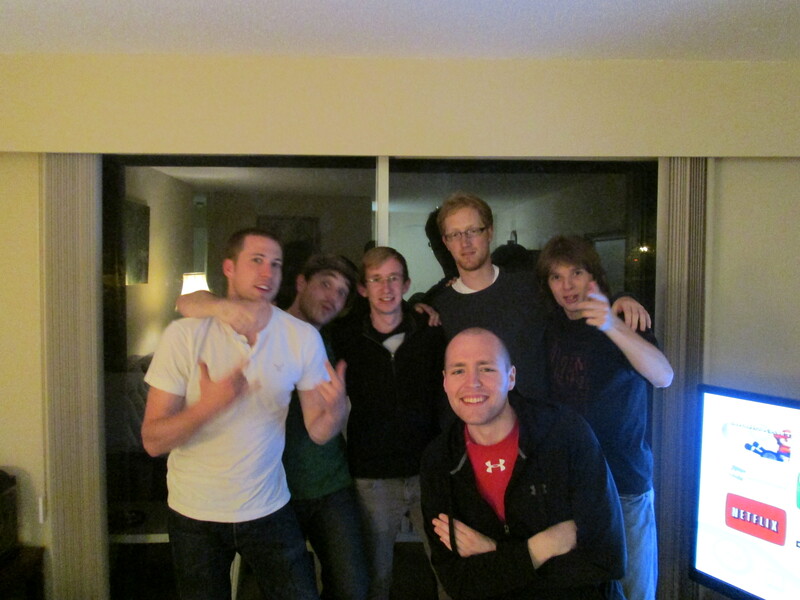 It was agreed that my final night in Vancouver was going to be a good one. I didn’t know what was going to happen or how it would go down but by the time I woke up when I had to leave I could tell that it had been an excellent time. 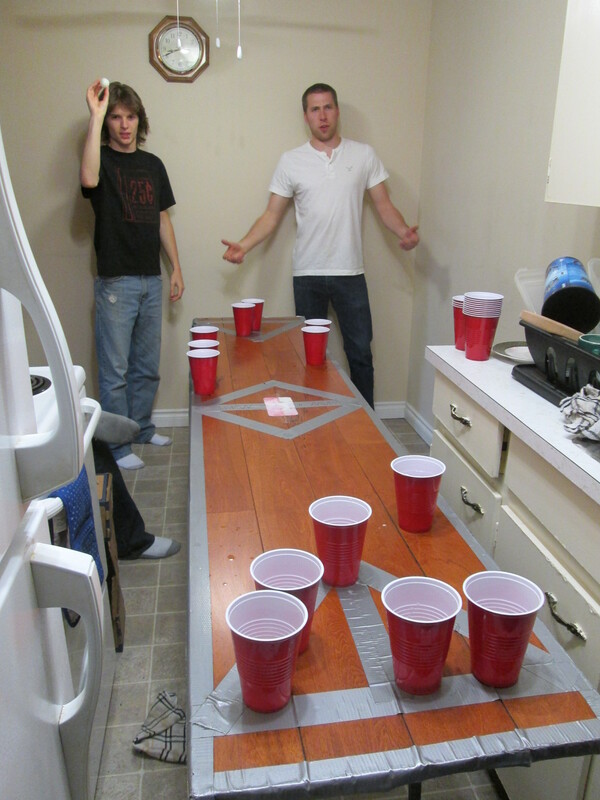 I started off at Mike’s, we hung out for a while before taking a drive to pick up a regulation sized beer pong table. This was the perfect way to start the evening’s entertainment. I’d never played beer pong before and I wasn’t expecting to be any good at it, but I managed to keep most of my shots on the table and threw a couple of impressive balls. After several rounds it was agreed that we should try another game; skadoosh. 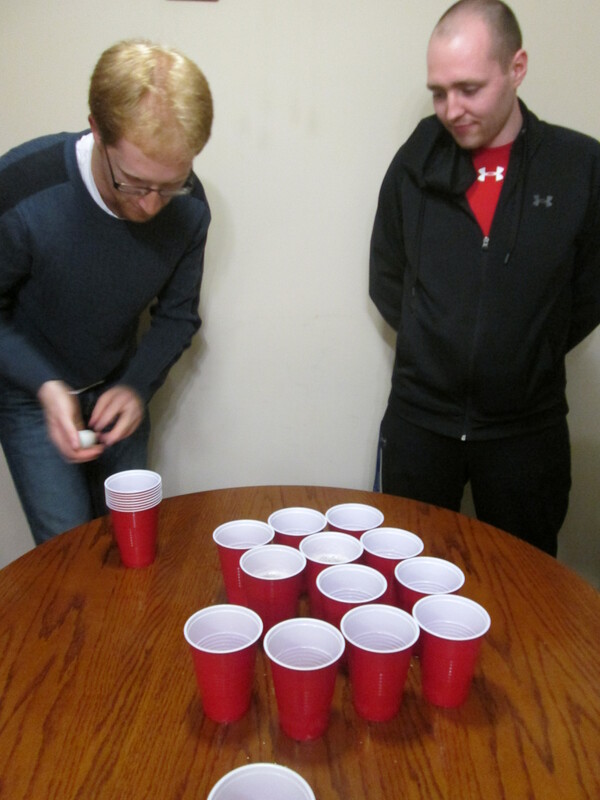 This is played by filling stereotypical red plastic cups with various amounts of beer and attempting to bounce a ping-pong ball into an empty cup. There are two empty cups and the aim of the game is to “slam” the player to your left, forcing them to drink from one of the full cups. 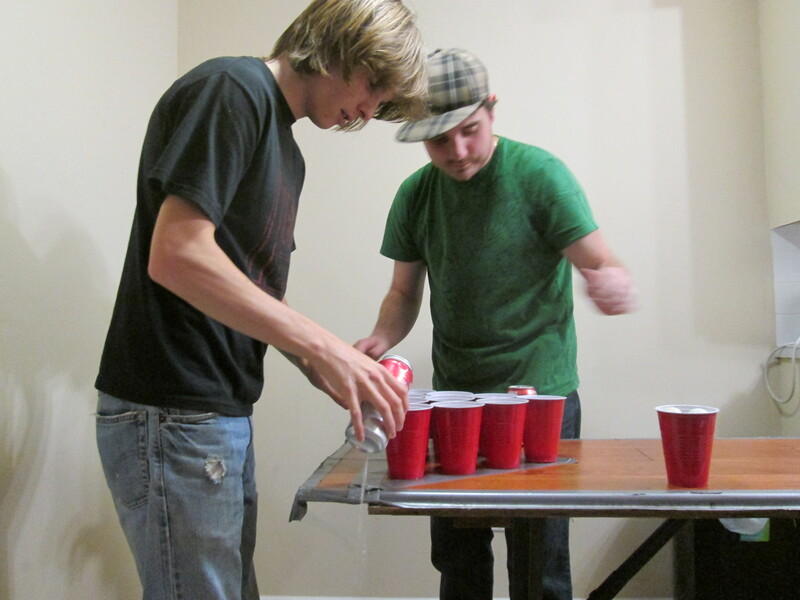 Once you have slammed your opponent and they have downed their delicious warm beer, they add the cup to their own, increasing the height that they have to bounce their ball. Super fun. By the end of the game and two pints laced with vodka later, a few of us decided it was time to head out to Ivan’s. I said goodbye to Mike and Curt for the last time, promising them both that one day I would be back. 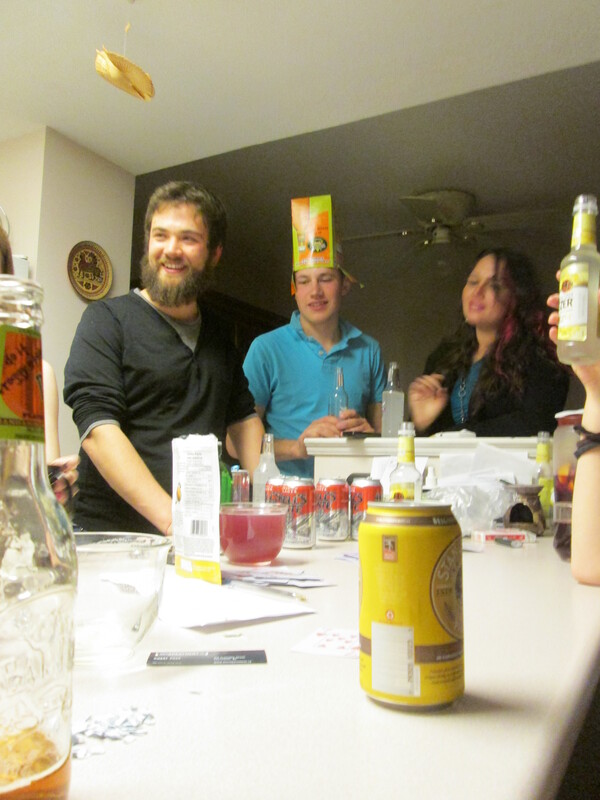 Once at Ivan’s, I found him with a few of his friends having just started a round of Kings. There was only one way this night was going to end; incredibly drunk and wishing I could have stayed for longer. After several rounds and way too much alcohol we called it a night and passed out, knowing that the following morning would bring incredible hangovers and my return to the road. When I eventually arrived in Seattle I was in no fit state to do anything. Once I had made my way to the hostel, I dumped my bags and went straight to bed. I slept through until being woken by the sun shining through the window onto my face. I was fortunate enough to be checked into the City Hostel who seem to be one of the few North American hostels capable of providing a reasonable breakfast. 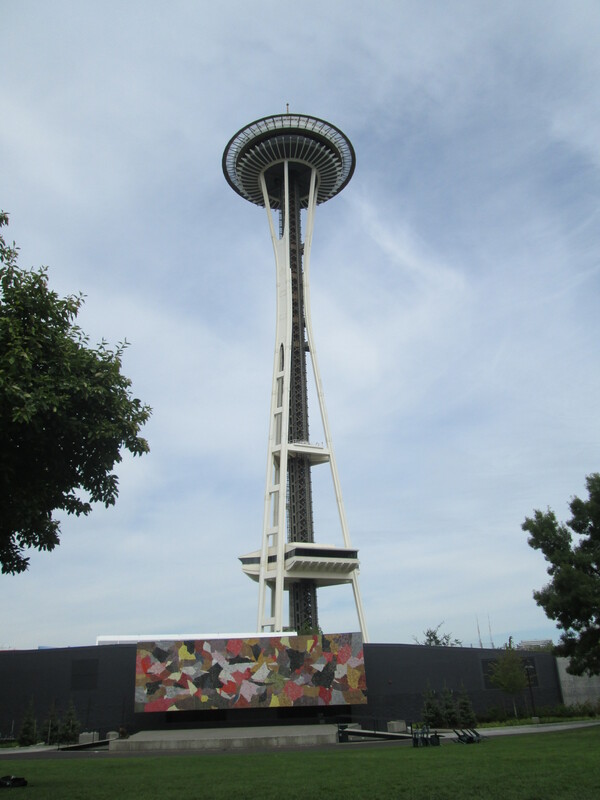 Once I’d eaten I made my way towards Seattle Center, the location of the 1962 Century 21 Exposition. Having considered the weather in Vancouver, I decided I’d take full advantage of the clear skies and make straight for the Space Needle. By the time I’d picked up yet another CityPass the weather was less impressive but I still went on up. It was constantly at the back of my mind that it could start raining at any time and if it did, then it would probably continue for the rest of my short stay in the city. 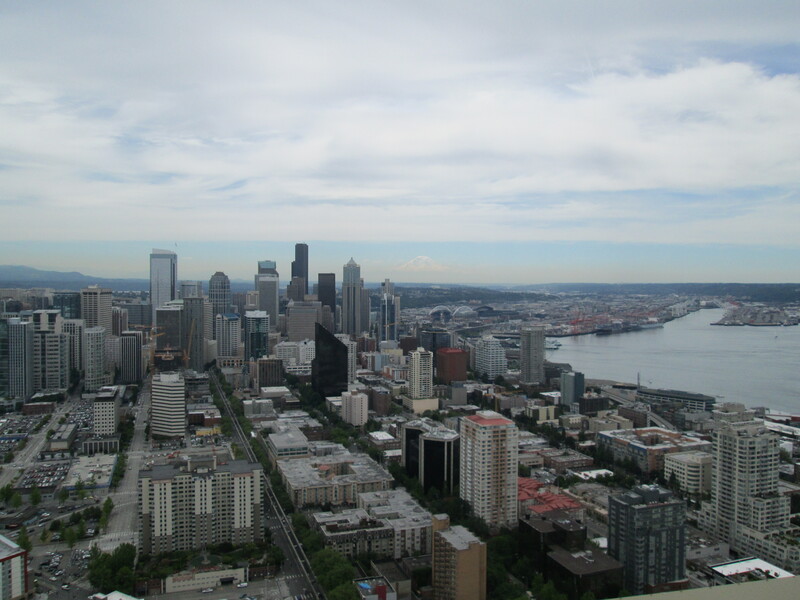 The exposed elevators took me up the tower and the air was clear enough to see the Olympic and the Cascade mountains that surround the city and the sky-line dominating presence of Mount Rainier; one of five active volcanoes in the state of Washington. I’ve also been led to believe that it’s considered one of the most dangerous; awesome. The views from the observatory are spectacular. 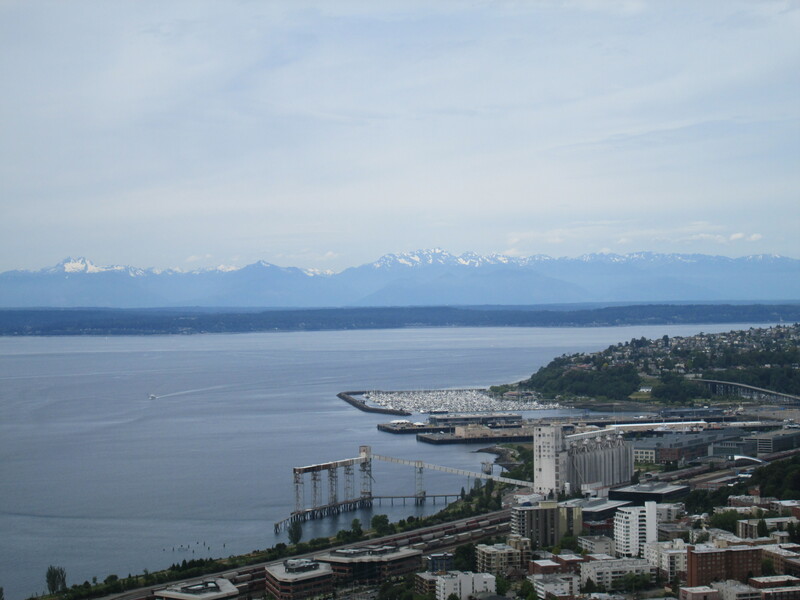 The combination of lakes, islands and the above mentioned mountains do wonders for the sprawling suburbs of Seattle. Having enjoyed the views I made my exit through the standard gift shop selling everything and anything that might in some way be related to the Space Needle. 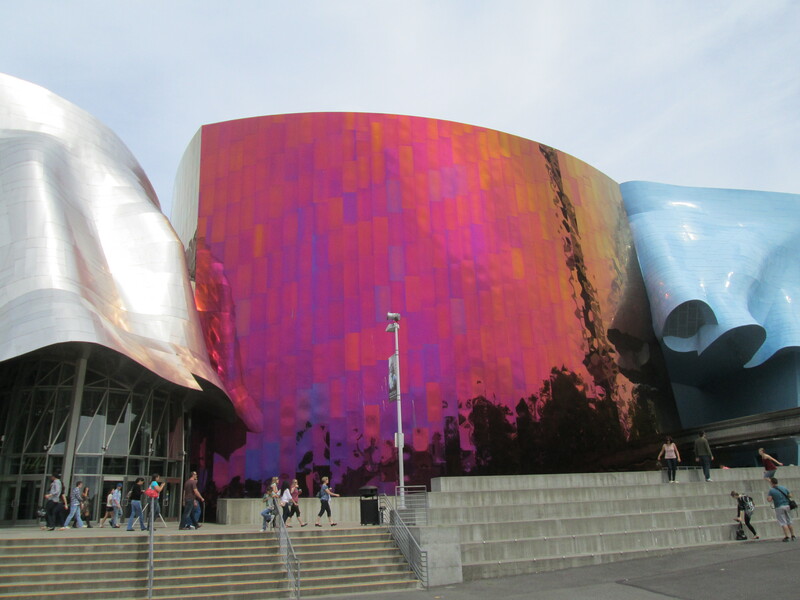 My new CityPass offered me access to several of the museums in the area and the one that took my fancy the most was the Experience Music Project and Science Fiction Museum. From the Space Needle the building looks pretty cool, according to one source it’s meant to look like Jimmi Hendrix had smashed a guitar. From the ground, it just looks like some wildly coloured blobs. 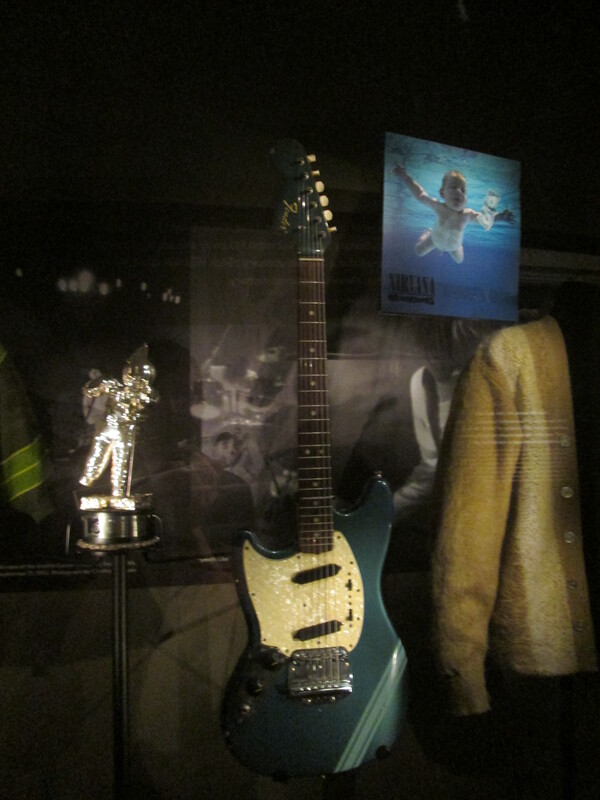 The main exhibits in the EMP were on Jimi Hendrix and Nirvana, both Hendrix and Kurt Cobain have links to Seattle, the first being born there and the second reaching the heights of fame there. There was a further exhibition on AC/DC chronicling their journey from Scottish migrants to the crown jewel of Australia’s music scene. It was, all in all, a pretty interesting museum and I found myself wishing that their were more exhibits that I could have become absorbed in. Once I’d had my fill of music, I made my way to the Science Fiction section, which was more of an explanation of what science fiction is alongside a collection of film props. 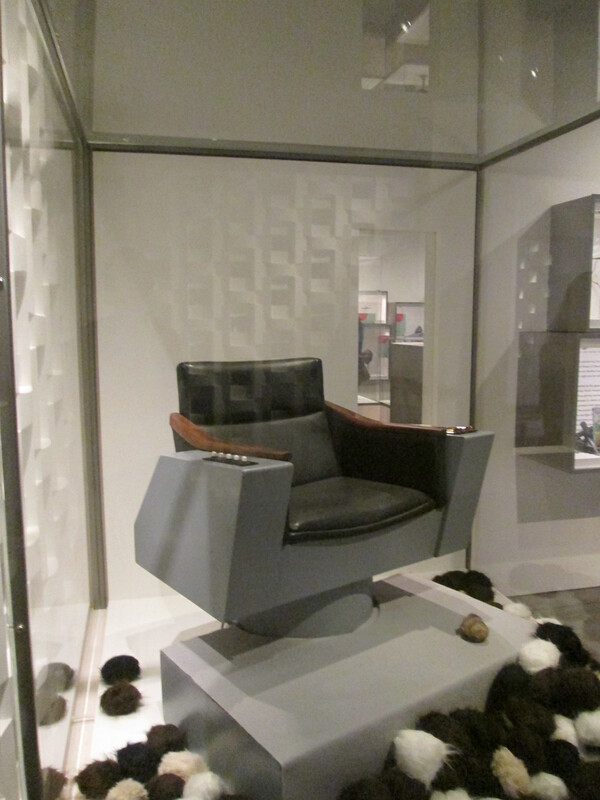 There were some pretty interesting things, models of xenomorphs from the Alien universe, the iconic coat worn by Neo in the Matrix, Captain Kirk’s command chair from Star Trek. 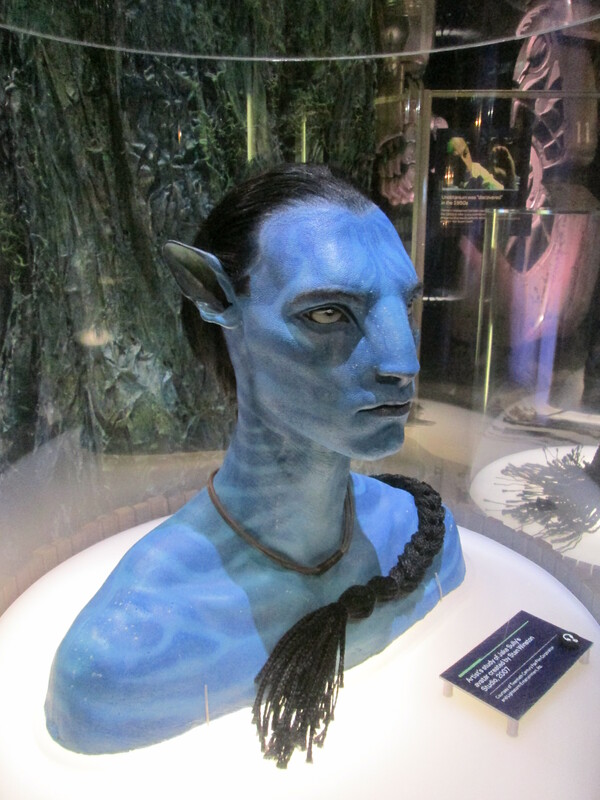 What could have been dedicated to more sci-fi delights was spread across an exhibit that was supposedly about fascination with horror, but again was more like a showcase of props from various iconic horror films and finally there was an exhibit dedicated to the film Avatar. I was one of those people who didn’t like Avatar, not even how it looked particularly appealed to me, but having spent some time looking into the making of the characters and the world in which they exist I have a little more respect for it and James Cameron. Once done with the museums and exhibits I took a short walk around the Belltown area finding a small grocery store to pick up some food for the rest of my stay before heading back to the hostel.